56 Leonard has been called the “Jenga” building due to its cantilevered floors, as well as the irregular spacing and location of the balconies throughout its 57 stories. Above the fifth floor, there is a 6-meter cantilever to the west and a 4.6-meter cantilever to the south, both of which were constructed over occupied New York Law School buildings. To build the superstructure safely, emphasis was placed on designing a custom, stackable perimeter screen system that provided full, passive fall protection. From the 45th floor up, all formwork and shoring, falsework, etc. had to remain in place to provide the necessary structural support to form and cast the floors above. The system was engineered so that once the concrete on the roof was cured, stripping could proceed from the top down until it concluded on the 45th-floor platform. 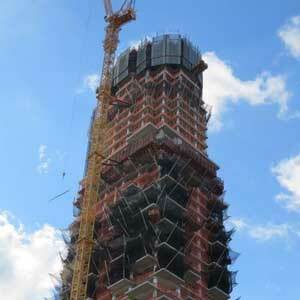 With an average floor-to-floor height of 2.7 meters, the use of heavy-duty 10k shoring towers was required.